The excruciating throb of a migraine, often accompanied by nausea or sensitivity to light and sound, can be brutally painful. As anyone who’s suffered a migraine can tell you, these headaches, when left untreated or treated ineffectively, can disrupt every aspect of a person’s life, from the ability to work to day-to-day activities and relationships. They can eventually lead to a loss of self-confidence, sense of control and self-esteem. In the United States, about 12 to 16 percent of the population suffers from migraine headaches, and 40 percent could benefit from preventative therapies, according to the American Migraine Prevalence and Prevention (AMPP) Study. Women experience migraines three times more frequently than men. Researchers have found that migraines have a greater overall impact on the lives of female sufferers, affecting their self-esteem, professional development and family and social life. Migraine is a biologically based disorder. Its symptoms are the result of changes in the brain, not a weakness in character or an inappropriate reaction to stress. For many years, scientists believed migraines were linked to the dilation and constriction of blood vessels in the head. They now believe migraine is caused by inherited abnormalities in certain cells in the brain. People with migraine have an enduring predisposition to attacks triggered by a range of factors. Specific, abnormal genes have been identified for some forms of migraine. People who get migraine headaches appear to have special sensitivities to various triggers, such as bright lights, odors, stress, the menstrual cycle, weather changes or certain foods and beverages. If you get a migraine, you may experience an aura five to 20 minutes before the attack. An aura may lead to seeing flashing lights, visuals resembling TV static or zigzag lines, or you may temporarily lose vision. Other classic symptoms of a migraine aura include speech difficulty, weakness in an arm or leg, tingling of the face or hands and confusion. An estimated 20 percent of migraine victims experience an aura prior to an attack. Even if you don’t have an aura, you may experience a variety of vague symptoms before a migraine, including mental fuzziness, mood changes, fatigue and unusual retention of fluids. The pain of a migraine is usually described as one-sided and is intense, throbbing or pounding and is felt in the forehead, temple, ear and/or jaw, around the eye or over the entire head. It may include nausea and vomiting and can last a few hours, a day or even up to three days. People who suffer from migraines may also experience cutaneous allodynia, a condition in which you feel pain on your scalp from a source that should not cause pain, such as a single strand of hair. Migraines can strike as often as nearly every day or as rarely as once every few years. Some women experience migraines at predictable times such as when menstruation begins or every Saturday morning after a stressful work week. Hemiplegic migraine:Patients with hemiplegic migraine have temporary paralysis on one side of the body, a condition known as hemiplegia. Some people with this form may experience vision problems and vertigo (a feeling that the world is spinning). These symptoms begin 10 to 90 minutes before the onset of headache pain. Complete recovery may take weeks. Ophthalmoplegic migraine: In ophthalmoplegic migraine, the pain is around the eye and is associated with a droopy eyelid, double vision and other sight problems. Basilar artery migraine: Basilar artery migraine involves a disturbance of a major brain artery. Preheadache symptoms include vertigo, double vision and poor muscular coordination. This type of migraine occurs primarily in adolescent and young adult women and is often associated with the menstrual cycle. Status migrainosus: This is a rare and severe type of migraine that can last 72 hours or longer. The pain and nausea are so intense that sufferers are often hospitalized. The use of certain drugs can trigger status migrainosus. Neurologists report that many of their status migrainosus patients were depressed and anxious before they experienced headache attacks. Headache-free migraine: This type is characterized by such migraine symptoms as visual problems, nausea, vomiting, constipation or diarrhea, chest or neck pain. However, there is no head pain. Headache specialists have suggested that unexplained pain in a particular part of the body, fever and dizziness could also be possible types of headache-free migraine. Chronic migraine: Chronic migraine, which affects approximately 2 percent of the population, is defined as headaches that occur at least 15 days a month for at least three months. In addition, to be diagnosed with chronic migraine, an individual must also have two or more of the following symptoms on eight or more days a month for at least three months: moderate to severe headaches; headaches on one side of the head; pulsating head pain; headaches aggravated by routine physical activity; headaches that cause nausea, vomiting or both; or headaches coupled with sensitivity to light and sound. Abdominal migraine: The pain of this type of migraine is felt in the middle of the abdomen rather than the head. Abdominal migraines usually last a few hours and occur mainly in children as a forerunner of migraine. Symptoms may also include nausea, vomiting and diarrhea. Retinal migraine: A rare form of migraine, retinal migraine starts with a temporary, partial or complete loss of vision in one eye followed by a dull ache behind the eye. Pain may spread to the rest of the head. When growing up, do you recall a family member who was sick much of the time? If so, did he/she exhibit any of the following symptoms: head pain that interfered with daily activities, nausea or vomiting, sensitivity to light or sound, numbness or speech difficulty? To what did he or she attribute symptoms of their headache: menstrual cycle, overwork, fatigue, stress or something eaten or drunk? Be prepared to discuss with your health care professional both the symptoms of relatives’ headaches and their methods for coping. When did you first develop headaches? Your sleep habits and family and work situations may also be discussed. Most of the time, a migraine diagnosis is made by focusing on your history and inquiring about past head trauma or surgery and about the use of medications. However, health professionals may also order a blood test to screen for thyroid disease, anemia or infections that might cause a headache. A magnetic resonance imaging (MRI) scan. Today, MRI is the preferred tool to rule out headaches associated with aneurysms (abnormal ballooning of a blood vessel) and brain lesions. MRI scans provide a more detailed view of the cerebral anatomy and are warranted in cases where migraine is not definitively ascertained by history alone. A magnetic resonance angiogram (MRA) is a type of MRI that looks at the blood vessels inside the body. It is a refined tool to pick up minute lesions of the vascular system of the brain such as small aneurysms. A computed tomographic (CT) scan. The CT scan produces images of the brain that show variations in the density of different types of tissue. The scan enables the physician to distinguish, for example, between a bleeding blood vessel in the brain and a brain tumor. The CT scan is an important diagnostic tool in cases of sudden headache caused by hemorrhage. An eye exam, to check for weakness in the eye muscle or unequal pupil size. Both symptoms are evidence of an aneurysm. A physician who suspects that a headache patient has an aneurysm may also order an angiogram. In this test, a special fluid that can be seen on an x-ray is injected into the patient and carried in the bloodstream to the brain to reveal any abnormalities in the blood vessels. A lumbar puncture (spinal tap), to rule out meningitis, encephalitis or a brain bleed if the headache is associated with neck pain, fever and/or sudden onset. The spinal tap takes about 30 minutes and may cause a headache due to the drop in cerebral spinal fluid pressure. There is also a small risk of infection with this procedure. Your health care professional will analyze the results of these diagnostic tests along with your medical history to make a diagnosis. 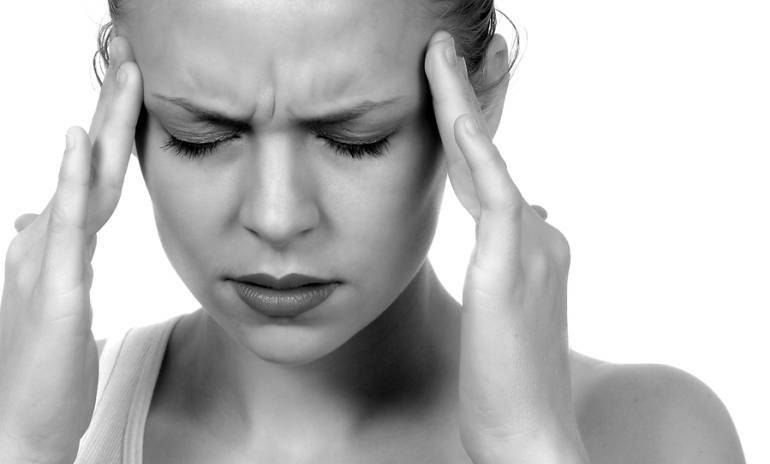 Migrainous headaches, the group that includes migraine. This type of headache is recognized as being principally “neurogenic-initiated,” eventually affecting the cerebrovascular system. Tension-type headache. These headaches involve the tightening or tensing of facial and neck muscles. Cluster headaches. These involve excruciating pain in one part of the head and are rare. They are more commonly found in men with associated eye tearing and nasal congestion on the side of the head pain. Traction and inflammatory headaches. Also rare, these headaches involve symptoms caused by other disorders, ranging from stroke to sinus infection to eye disorders to an abnormal growth or mass. Health care professionals say that many women don’t express the true extent of the pain they feel with migraine, perhaps because they’re worried about “complaining” too much. One problem may be that many people with migraines think there is nothing that can be done. They may have watched their mother or grandmother suffer from migraines, and think they simply have to suffer, too, or resort to the often-ineffective treatments their older relatives used to cope with their migraines, despite significant advances in medication and treatment options available today. Patients commonly deal with a migraine by taking some kind of pain relief medication, lying in bed, struggling with nausea and vomiting and trying to minimize lights, noises and smells that can either trigger a migraine attack or make it worse. Unfortunately, many migraine sufferers put off seeking treatment despite the very effective treatments available today. If you have migraines, it is important to develop a good relationship with your health care professional because the condition is recurrent. You can build an active partnership first by finding a health care professional with experience in treating migraine who understands that migraine is a biological disease. Headache specialists also recommend looking for a health care professional who is willing to consider a variety of options for treatment, including over-the-counter and prescription medications, as well as lifestyle changes. Communicating treatment needs can be difficult for migraine sufferers for a variety of reasons, but communication is key to effective treatment. About half of migraine patients stop seeking care for their headaches, in part because they are dissatisfied with their therapy—a statistic that may be improved with proper communication. A number of communication and treatment aides can help open a dialogue with a health care professional about migraine pain and treatment. Many migraine sufferers find that keeping a headache calendar is a first step in gaining some control over their headaches. This tool is especially helpful as you begin designing a treatment program with your health care professional. possible triggers, including dietary, stress, environmental, etc. The National Headache Foundation at www.headaches.org also has numerous tools and information to help headache sufferers, including a headache diary. Another headache management technique is to make a checklist of your symptoms and treatment responses, then rank the effectiveness of your current treatment program. Use descriptors ranging from very satisfied to very dissatisfied with several categories in between to determine how satisfied you are with your current treatment program. Also rank these attributes in terms of how important they are for you. Use the descriptors––very important to not important––to prioritize and personalize your treatment program. Next, list those activities you feel your migraines most often disrupt. Be sure to include work, family interactions, personal time, sleep, exercise, social opportunities or other activities you’ve canceled one or more times because of migraine attacks. In fact, recording and communicating your migraine-related disruptions and disabilities with your health care professional may be the key to receiving the most comprehensive treatment course. Health care providers are more likely to manage patients’ treatment more effectively and aggressively when they receive detailed information on symptoms. Unfortunately, headache-related disability information is often overlooked during consultations. That’s why there are tools designed to improve communication about headache-related disability, such as the Migraine Disability Assessment questionnaire or the Migraine Disability Assessment Test, to improve migraine management. Next, make an appointment with a health care professional to discuss your migraine experiences. Bring your checklists with you. Ask for a treatment plan that incorporates those components you feel are most important to your headache treatment and lifestyle. Before leaving the professional’s office, arrange a follow-up appointment to discuss the treatment’s success or failure. Finally, once you begin a treatment program, keep a diary of the frequency and severity of your headaches and how your treatment plan is working. Share the diary with your health care professional on your next visit and be willing to modify your treatment plan if necessary. It can take patience and several changes to find the individualized treatment program that works for you. In general, health care professionals develop a migraine treatment plan depending on the frequency of migraine headaches. In general, infrequent headaches, which come once or twice a month, are treated with a fast-acting, acute-type medication that responds to the occurrence of a headache and relieves head pain, nausea and sensitivity to bright light and/or sound. Women who have migraines more frequently or who have been diagnosed with chronic migraine need a different strategy; a preventive medication is often recommended. One of the most commonly used classes of drugs for migraines are called triptans. Scientists are not sure exactly how they work, but the drugs reduce the pain of migraines and limit symptoms such as auras. Specific triptans include naratriptan (Amerge), rizatriptan (Maxalt), sumatriptan (Imitrex), zolmitriptan (Zomig), almotriptan (Axert), frovatriptan (Frova) and eletriptan (Relpax). All listed triptans are available in pill form. Sumatriptan and Zomig are also available in nasal sprays. Sumatriptanis available via injection. It is also available as Sumavil, for needle-less injection. The fastest acting and most effective form is the injectable form. In addition, a new combination of sumatriptan and naproxen sodium (Treximet), is now available; this oral medication is more effective at relieving migraine symptoms than either drug by itself. Ergotamine (Migergot, Cafergot), a drug that was the common prescription choice for migraines before triptans. It is less expensive than triptans but may not work as well. It is usually prescribed for people with long (greater than 48 hours) or frequent migraines. Dihydroergotamine ( Migranol), an ergotamine derivative that is more effective and has fewer side effects than ergotamine. Nonsteroidal anti-inflammatory agents (NSAIDs) have frequently been used successfully for moderate headaches. The NSAIDs include ibuprofen and naproxen sodium. The NSAIDs in combination with caffeine may help moderate to severe migraine headaches. Corticosteroids, including hydrocortisone and dexamethasone. Butalbital combinations. Drugs that combine the sedative butalbital with acetaminophen or aspirin ( Bupap, Phrenilin Forte) are used to treat migraines in some cases. Some drug combinations also include codeine or caffeine (Fioricet, Esgic-Plus). These medications come with a high risk of rebound headaches and other side effects, however, so they are not used often. Because ergotamine and dihydroergotamine can cause nausea and vomiting, they may be combined with antinausea drugs. Experts caution that ergotamine should not be taken in excess or by people who have angina pectoris; severe hypertension; or vascular, liver or kidney disease. Same with DHE; also, pregnant women should not use this drug. Beta-blockers stop blood vessel dilation. They include propranolol, atenolol, metoprolol, nadolol and timolol. Note: Health care providers recommend that people taking beta blockers, especially people with a history of heart problems, do not suddenly stop taking these drugs. Calcium channel blockers, especially verapamil, may help prevent migraine in people who are prone. Anticonvulsants. Some drugs used to prevent seizures, such as divalproex, gabapentin and topiramate, may help prevent migraines in some people. In high doses, these medications may cause side effects such as nausea, hair loss and dizziness. Antidepressants. In some cases, antidepressants are used to help prevent migraines. These include tricyclic antidepressants such as amitriptyline, nortriptyline and protriptyline. Note: The U.S. Food and Drug Administration warns that antidepressants may increase suicide risk, particularly in adolescents and children. Anyone taking antidepressants should be carefully watched for any signs of suicidal behavior. If you are planning to take antidepressants, talk to your health care provider about these risks and always read package information. Speak to your physician about available treatment options. Drug therapy for migraine is often combined with biofeedback, cognitive behavioral therapy or relaxation training. Biofeedback is a technique used to gain control over a function that is normally automatic (such as blood pressure or pulse rate). The function is monitored and relaxation techniques are used to change it. Biofeedback uses electronic or electromechanical instruments to monitor, measure, process and feed back information about skin surface temperature, blood pressure, muscle tension, heart rate, brain waves and other physiologic functions. Biofeedback can be practiced at home with a portable monitor. The ultimate goal of treatment is to wean you from the machine so you can use biofeedback methods anywhere at the first sign of a headache. Relaxation training involves learning to counteract muscle tension by relaxing your mind and body through methods such as yoga, meditation, progressive relaxation and guided imagery. Relaxation techniques may be used alone or in combination with biofeedback. In addition, the U.S. Food and Drug Administration recently approved a medical device that uses transcutaneous electrical nerve stimulation (TENS) to help prevent migraines. Research showed that the device reduced the number of migraines experienced per month and the amount of migraine medication required. The battery-powered device, Cefaly, resembles a plastic headband with an electrode that applies electric current to the forehead to stimulate branches of a nerve that has been associated with migraines. The device is only for adults and requires a prescription; women who are pregnant or might become pregnant should discuss usage with their health care professionals. This therapy helps you identify areas in your life and environment that may be triggering your headaches. People with migraine have the same sorts of stressors most people grapple with, but for migraine patients, the stress can trigger migraine episodes. Thus, stress management training helps you to recognize the thoughts, feelings and behaviors that bring on headaches and work to handle them without triggering a headache. Some migraine sufferers benefit from a treatment program that includes eliminating headache-provoking foods and beverages. That’s why it is so important to keep a migraine diary to identify your unique triggers. A diet that prevents low-blood sugar (hypoglycemia), which can cause dilation of the blood vessels in the head, may help some migraine sufferers. This condition can occur after a period without food: overnight, for example, or if you skip a meal. Those who wake up in the morning with a headache may be reacting to the low-blood sugar caused by the lack of food overnight. Treatment for headaches caused by low-blood sugar consists of scheduling smaller, more frequent meals. A special diet designed to stabilize your body’s sugar-regulating system may be recommended. For the same reason, many specialists also recommend that migraine patients avoid oversleeping on weekends. Sleeping late can change the body’s normal blood sugar level and lead to a headache. Establishing regular meal times—avoid skipping or missing a meal. Increasing exercise, which improves blood flow to the brain and boosts the production of endorphins, naturally occurring painkilling substances the body produces. The key to effectively managing migraine headaches is identifying the unique triggers that provoke your headaches and then minimizing them or eliminating them. Hormonal triggers. Women may have headaches around the time of their menstrual period, possibly related to the body’s fluctuation of estrogen and progesterone. But there are no steadfast rules when it comes to hormonal triggers. Taking oral contraceptives and hormone replacement therapy and even pregnancy have been blamed for causing severe and frequent migraine attacks. But other women who suffer from migraine say these things improve their condition or make the attacks disappear altogether. Following menopause, when estrogen and other hormone levels decline, women who previously suffered from migraines may find their headaches subside completely. In some women, however, migraines come on or worsen during menopause as a result of fluctuating hormone levels. Diet triggers. Some migraine sufferers have an acute sensitivity to a specific food or foods. Researchers are not certain why particular foods provoke migraine headaches, but they suspect it is because the foods’ chemical properties affect the diameter of blood vessels in the brain.Tyramine, for example, a chemical produced as a result of the natural breakdown of the amino acid tyrosine, is widely viewed as a migraine provoker. Tyramine levels increase in some foods when they are aged, fermented or stored for long periods of time. Red wine, aged cheeses and processed meats (like hot dogs and bologna) are good examples. Other common food-related triggers include: champagne, ripened cheeses (cheddar, Stilton, Brie, Camembert), nuts and nut spreads, sourdough bread, onions, lentils, snow peas, citrus fruits, bananas, sour cream, chocolate, and MSG, the flavor enhancer found in soups, restaurant food, frozen foods and potato chips. Additionally, if you’re used to caffeinated beverages, foods or painkillers, withdrawal from these substances can trigger a headache, though not necessarily a migraine.In addition to particular foods, a change in eating patterns can trigger headache, although not necessarily a migraine. Fasting, missing meals or dieting may also cause low-blood sugar levels, another possible migraine trigger. Environmental triggers. Altitude changes, excessive light and noise and changes in weather patterns (such as high winds and high humidity) are a few of the many environmental triggers of migraines. Airplane travel is one of the biggest triggers. When cabin pressure drops, blood vessels dilate and expand, which may lead to a migraine attack for some people. Bright light, whether from television, a movie screen or the sun at the beach, may also provoke attacks. Excessive or repetitive noises can also trigger migraine headaches, as well as strong odors (such as cigarette smoke). As with food triggers, you should carefully identify environmental triggers and avoid them, when possible. Emotional triggers. Anticipation, excitement, stress, anxiety, anger and depression are known to trigger migraine attacks. Even “positive” excitement, such as a job promotion or a wedding, can provoke a migraine attack. An effective stress management system can help a migraine sufferer prevent or minimize headaches triggered by these factors and can contribute to a sense of overall good health. Activity triggers. Changes in lifestyle patterns can also bring on a migraine. Women have reported migraines resulting from too little sleep, too much sleep, overworking and physical overexertion. Vacation time, with its inherent rushing, excitement and altered daily schedule, often triggers a migraine. Sometimes, sexual activity may provoke migraine attacks. Other triggers include motion (such as plane, car, bike and carnival rides), head injuries and interaction with certain drugs, including over-the-counter pain relievers. Always consult your health care professional about medications. Migraine may start in childhood, but typically first attacks occur in adolescence or early adulthood. The headaches continue throughout adulthood, but in some women may diminish with menopause. Some patients will complain of migraine attacks throughout their lives. Each individual attack usually lasts from four to 72 hours. An estimated 13 percent of Americans experience migraine headaches. According to the National Headache Foundation, industry loses an estimated $31 billion per year due to absenteeism, lost productivity and medical expenses caused by migraines. Women experience migraines more than twice as often as men. Migraine is a biologically based disorder. Its symptoms are the result of changes in the brain and may result from a difference in the way you react to stress, as well as other triggers. In an estimated 20 percent of migraine cases, the headaches are preceded by visual, auditory or physical auras, bright spots or uneven, unstable lines moving before the eyes. Many women fail to seek help for their migraines, perhaps figuring there are no effective treatments. Certain factors are known to trigger migraines. They include menstrual and ovulatory cycles, certain foods, weather changes, inadequate rest, strong odors, bright or flashing lights and stress. Migraines can strike as often as several times a week or as rarely as once every few years. Episodes can occur at any time. Many migraine sufferers have a close relative who also suffers from the headaches. People suffering from frequent headaches that are long lasting, frequent or cause significant disability may want to consider preventive medication such as antidepressants (which adjust serotonin levels), heart medication such as beta blockers and calcium channel blockers and antiseizure medication. In people who suffer from migraines less frequently, drugs such as triptans and certain opiates can help treat acute attacks. Do migraine headaches run in families?Research suggests that migraine headaches often run in families. Many migraine sufferers have a close relative who also suffers from them. It’s estimated that nearly 20 million women in the United States suffer from this debilitating, biological disease. So, chances are greater that your daughter may get migraines, though you should watch for symptoms in your son, too. Some of my headaches go away with aspirin and some don’t. Should I get medical help for my headaches?Absolutely. You may very well be a migraine sufferer. As many as 50 percent of all migraine sufferers are unaware that their pain is from a migraine. Some attribute their headaches incorrectly to sinus trouble or stress or they simply don’t question the source of the headache. Another study showed that the typical patient suffers headache pain for more than three years before seeking treatment. If you suffer from headache pain you should take an active role from the start, along with your health care professional, in determining the type of headache and its cause. I have debilitating headaches only once or twice a year. Should I bother to seek treatment?Yes. It is not uncommon for migraine sufferers to experience infrequent episodes. Now would be a good time to seek advice from a health care professional, since migraines can become more frequent due to lifestyle changes, hormonal changes or other increases in exposure to triggers. I don’t want to take a pill every day for my migraines. Are there treatment options for me?Yes. Some medications are taken at the onset of symptoms and can be very effective at relieving migraine pain. Nonpharmacological treatments such as biofeedback and preventive measures such as eliminating triggers are also very effective. It is important to share your treatment preferences with your health care professional so that you can find a treatment you can live with. There are so many possible triggers for migraines. How can I figure out which ones are causing my headaches?Unless your triggers are obvious to you, such as getting a migraine every time you fly in an airplane, the only way to identify them is by keeping a headache calendar. Your calendar should include: when your headaches occur; severity and duration of the headache; possible triggers, such as foods you’ve eaten and beverages you’ve consumed, weather patterns and dates of your menstrual periods; and symptom-relief interventions attempted. I do not experience “auras” or any other problems with my vision during my headaches. Does this mean my headaches are not migraines?Migraines do not have to include auras. Migraines with auras affect an estimated 20 percent of migraine sufferers. These migraines are characterized by the appearance of neurological symptoms, such as flashing lights, zigzag lines or loss of vision, five to 20 minutes before the migraine. My schedule is so crazy that I don’t have time to eat regular meals. Could this be contributing to my headaches?Yes. Migraines can occur after a period without food: overnight, for example, or when a meal is skipped. Prevention of these headaches includes maintaining regular meal schedules, avoid skipping a meal or fasting. You may want to avoid oversleeping on weekends, which may lead to a headache, although not necessarily a migraine. What are some things I can do prevent the onset of migraine?In addition to avoiding triggers for your headaches, there are some basic lifestyle changes that may help you control your headaches and increase your overall health. They include: adopting regular sleeping habits, modifying eating habits to include a healthy diet and increasing exercise.